Figure 29.3. sFLC responses in 5 patients with κ light chain deposition disease. Figure 29.4. Monitoring a patient with LCDD using sFLC assays. (Reproduced by permission of Oxford University Press. It is logical to monitor LCDD patients using sFLC assays. Although there is no published data formally validating the use of the sFLC assays for assessing haematological response in patients with LCDD, the personal experience of many authors confirms their utility  and international and European guidelines recommend sFLC analysis for monitoring LCDD (Section 25.3.1) . Clinical case history 2 illustrates the benefit of sFLC analyses in a patient who was difficult to monitor by other methods . Wechalekar et al. monitored 10 LCDD patients receiving a range of systemic chemotherapy, (and autologous stem cell transplant [ASCT] in 2/10 cases). Eight patients had sFLC responses, with a median decrease of 63% (range 31 - 95%), compared with pre-treatment values. One patient, who had a normal sFLC ratio pre-treatment, had no change in sFLC levels but had a very good partial response of the monoclonal intact immunoglobulin post-treatment. Only two patients had complete normalisation of sFLC levels. The authors concluded that sFLC analysis was useful for monitoring responses to treatment. Hassoun et al. reported on five patients with LCDD, one with LHCDD and one with light chain proximal tubulopathy (a disease characterized by κ-restricted crystal deposits in the proximal tubule cytoplasm) . All had abnormal sFLCs at diagnosis, whereas only one patient had a monoclonal band visible by SPE and two patients had IgGκ monoclonal proteins identified by sIFE. Patients were given high-dose melphalan and ASCT with good responses that could be monitored with sFLC assays (Figure 29.3). Similarly, Jiminez-Zepeda et al. found that measurement of sFLCs was useful in the follow-up of six patients with LCDD treated with bortezomib and ASCT. All six patients had elevated sFLCs at diagnosis whereas only two patients had serum monoclonal proteins >10 g/L. A decrease in the levels of involved sFLCs was associated with a significant reduction of proteinuria. Similarly, Minarik et al. 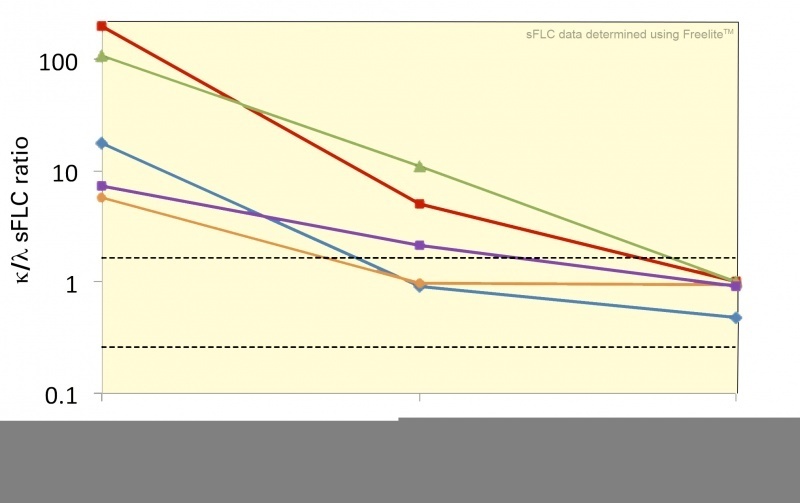 reported rapid and deep reductions in sFLC levels within two cycles of treatment with bortezomib-based induction regimens in three patients with LCDD. A patient with LCDD affecting the kidney, monitored with sFLC assays . A 59-year-old Caucasian male presented to nephrologists with flu-like symptoms, hypertension and swelling of the face, hands and legs. Urinalysis revealed he had nephrotic range proteinuria (13.9 g/24 hours) and serum creatinine was elevated at 200 μmol/L. A renal biopsy showed nodular glomerulosclerosis with evidence of LCDD on electron microscopy (granular electron-dense material in the tubular basement membranes). Congo red staining was negative. Serum electrophoresis, immunoglobulin levels and urinary Bence Jones protein assays were all normal. The patient was referred to the haematology department to rule out an underlying clonal B-cell disorder. A bone marrow aspirate and trephine revealed normal cellular marrow with no morphological or immunophenotypic evidence of MM. Congo red staining was, again, negative and a SAP scan also showed no evidence of amyloid deposition. Serum was tested for sFLCs with the following results: κ sFLC 526.0 mg/L (normal range 3.3 - 19.4 mg/L), λ sFLC 64.6 mg/L (normal range 5.7 - 26.3 mg/L) and κ/λ ratio 8.14 (normal range 0.26 - 1.65) (Figure 29.4). The patient subsequently developed atrial fibrillation. A 24-hour tape showed irregularities in the atrial chamber and intermittent disruption of AV node conduction. A dual chamber pacemaker was fitted and cardiac biopsy performed, which showed no evidence of amyloid or light chain deposition. His hypertension was treated with an angiotensin-converting enzyme inhibitor. However, within 12 months his renal function had deteriorated further (serum creatinine reached 300 μmol/L) and he continued to have heavy proteinuria. In order to prevent further progression of his renal disease, the patient was treated with 3 cycles of VAMP chemotherapy (vincristine 0.4 mg/day for 4 days, doxorubicin 9 mg/m2/day for 4 days and methylprednisolone 1 g/m2 for 5 days per cycle). Renal function subsequently improved (serum creatinine fell to ~200 μmol/L) and this was accompanied by decreasing sFLC levels and κ/λ ratio. Nine months after the chemotherapy, urinary protein excretion had fallen to 4.4 g/24 hours. For the following year, renal function remained stable but subsequently, the κ/λ sFLC ratio and serum creatinine concentration began to increase again. 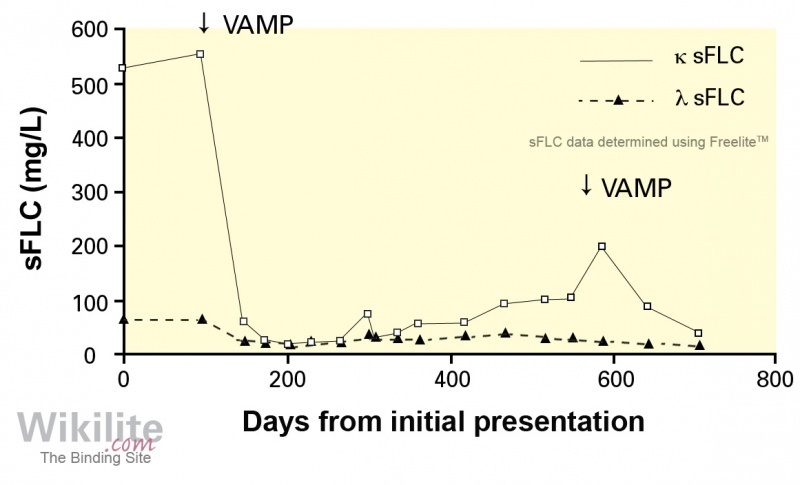 The patient was treated with a further 3 cycles of VAMP and again, similar improvements in renal function and sFLC levels were seen. The authors concluded that this case was the first to demonstrate a direct relationship between the measurement of sFLCs and renal function in LCDD. What proportion of patients with LCDD have abnormal κ/λ sFLC ratios? Between 78 and 100% in different series (Section 29.2).